You know what they say about real estate: location, location, location! Well, today’s discovery here on homify 360° neatly ticked that box, as it stands proudly on the edge of a cliff that overlooks the majestic ocean. 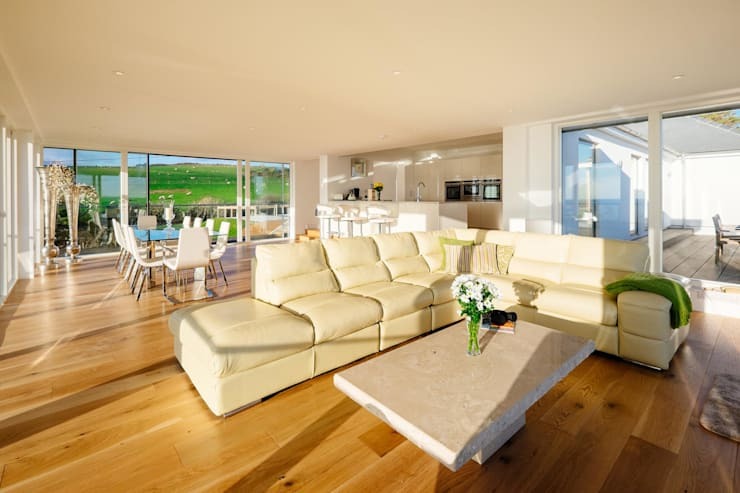 Located in Devon, southwest England, this property commands the best of landscape- and sea views, spoiling its fortunate residents day in and day out. But seeing as this is homify, the exterior view is not the only thing we are interested in; it’s the house’s excellent layout and beautiful style that has us so excited (not to mention a wee bit green with jealousy). 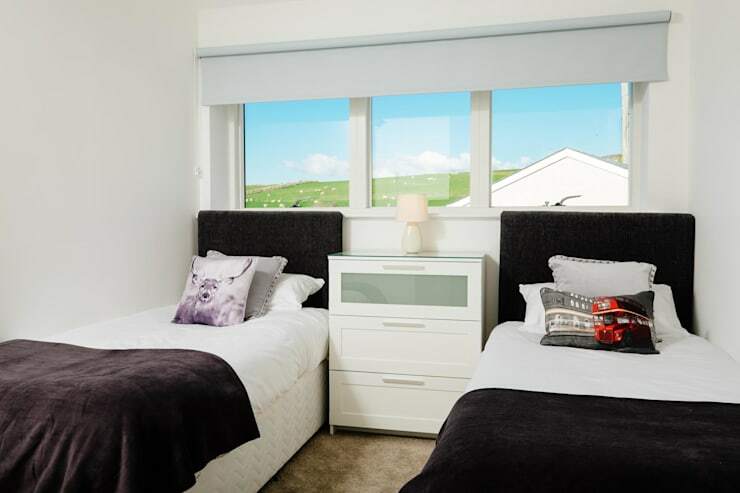 The house includes five beautifully furnished bedrooms – all with en-suite wet rooms! We can definitely see the appeal of this house’s location – that sunshine casting a golden glow on the property is pure magic. 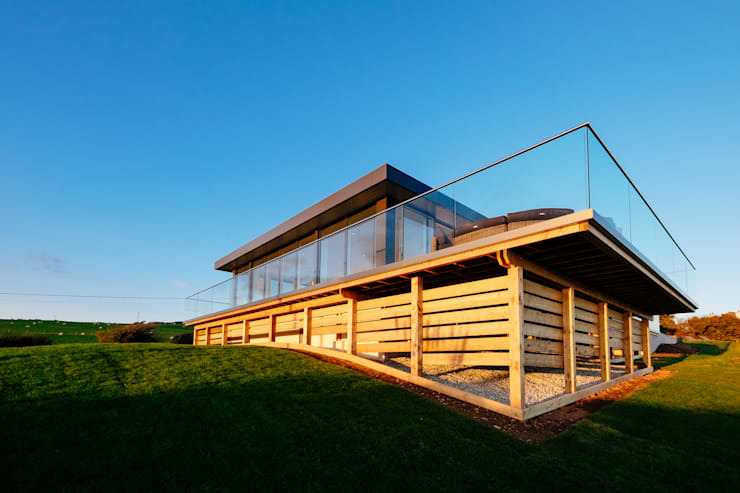 Due to the house’s construction, all of the main features are located on one floor, helping the structure to maintain a low profile and highlighting the expansive horizon and panoramic setting of the surroundings instead. This house definitely embraces its fantastic location. 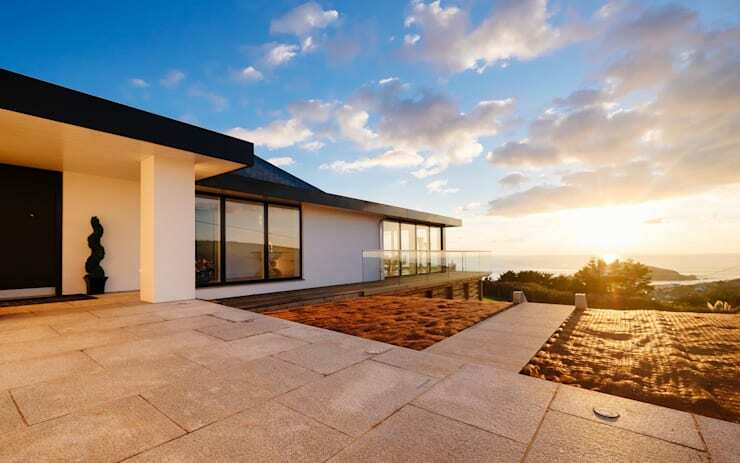 With its transparent glass railing and long horizontal lines stretching far beyond the home’s roof, the house appears to reach towards the ocean. Who could blame it? Can you imagine having a comfy sit-down on that spacious balcony while enjoying the sun’s golden glows and hearing the soft roaring of the ocean waves? We are crazy about the way this warm-wooded hallway is lit up by the incoming rays of the sun (and bounces off that silver sculpture). 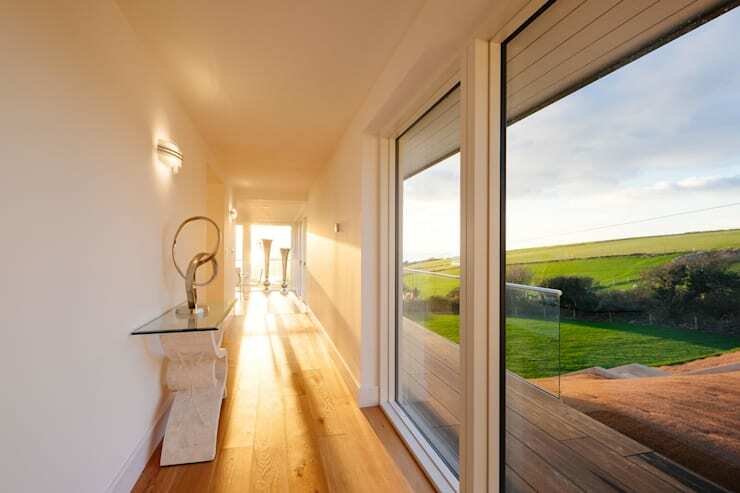 The generous windows have been well equipped with a mechanised blind that can be lowered in order to bring full shade to the house’ interiors when required – a most welcome touch for a home that’s obviously receives its fair share of sunshine. 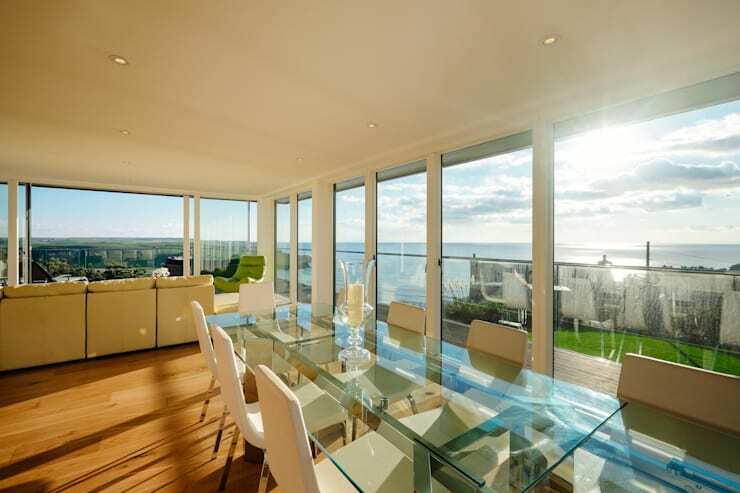 The open-plan living area (which consists of the living room, dining room, and kitchen) features plate glass on three sides, allowing that sensational seascape to become part and parcel of the interior setting. The dining table with its reflective surface adds some more glossiness to the scene, especially when the light hits that glass. A cream-coloured, L-shaped couch presents the perfect seating spot to enjoy that captivating view. And since it’s coated in such light-toned leather, the couch won’t absorb nearly as much heat like a darker furnishing would do. That’s the same reason why the overall colour pattern is made up of light neutrals: greys, off-whites, and creams all adding visual spaciousness and elegant glamour to the interior space. 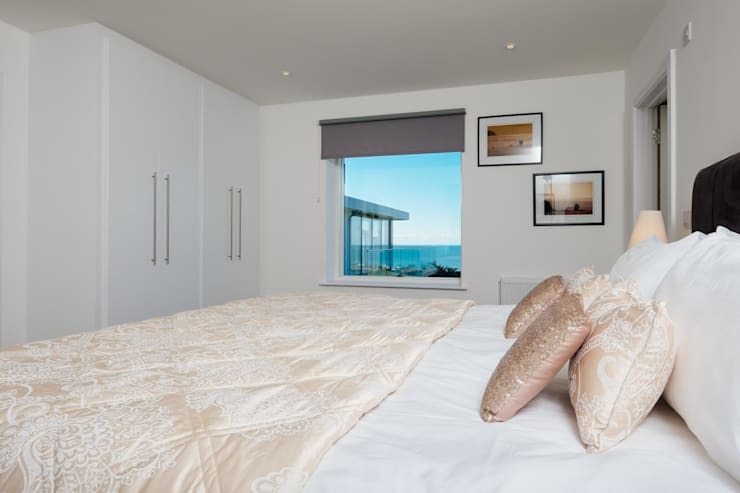 Due to the clever design of the house, all bedrooms get an ocean view, even if it’s just one window that brings in a bit of that majestic blue in the distance. Following the same successful colour scheme of the other interior rooms, this bedroom also flaunts a neat selection of light neutrals. And we are pleased to notice the commitment to storage, thanks to the floor-to-ceiling closets. When it comes to the children’s room, a bold statement is made with a simple and deliberate combination of colours. The black headboards and dark-toned throws break the white look ever so slightly, instilling a sense of energy and character into the room. Be sure to see our vast range of design- and décor ideas for children’s rooms here on homify. While the house has proven its commitment to style and high-quality elegance, it also has a fun side to it, as confirmed by the game room. 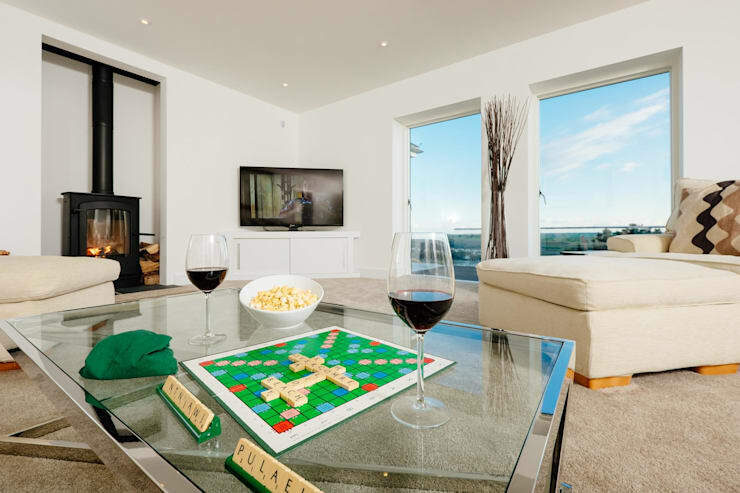 Here we get a sneak peek of the coffee table where a Scrabble game is in progress; however, a pool table and exercise bike, among other things, are also located here. And since a fireplace and TV take up space on the one side, it means this room becomes the perfect relaxation spot during chilly weather. A fabulous touch to a remarkable house! Want to see some more beach houses? Then you are sure to love: Beach House on the Edge of Paradise. We love it, but can’t speak for everyone. Tell us what you think of this seaside house.